Drilling by AMAX in the late 1960s and early 1970s includes nine holes which delineate a continuous zone of nickel-copper sulphide mineralization in the Basal Series ranging from 15 to 110 meters in thickness over approximately 1.5 kilometers strike with average grades of 0.42% nickel and 0.23% copper. Platinum and palladium assays, completed as composite samples over select intervals only, demonstrate thick intervals of enrichment, confirming the potential for Platreef-style deposits in the lower Stillwater Complex. Nickel and copper grades in these drill holes are comparable to those in the Platreef deposits. Limited data is available for platinum and palladium although select intervals were composited with intercepts of up to 1.4 g/t Pt+Pd. Additional drilling will be needed to better define PGE content. These drill holes confirm that the geophysical conductive high in this area is targeting high-sulphide mineralization which remains open along strike and to depth with untested parallel conductive anomalies. Initial bench-scale metallurgical results from the Camp Zone completed by AMAX are very encouraging and demonstrate that, though Stillwater West is still an exploration stage asset with a lot of room to grow, preliminary testing supports the potential for effective nickel and copper sulphide flotation along with recovery of a significant PGE component. As shown in Figure 1, the Camp Zone target area covers 1.8 km of strike length and represents one of eight major electromagnetic geophysical conductors defined across the 25-kilometer length of the Stillwater West project. Most of the work to date at Camp Zone has focused on disseminated to net-textured sulphide mineralization within cumulates of the Basal Series and adjacent country rocks. Drilling by Amax in the late 1960s through mid-1970s focused on exploration for nickel and copper. Platinum and palladium analyses were completed on some intervals on a composite basis with assays up to 1.4 g/t Pt+Pd, and select holes report PGE assay results composited over long intervals including hole 355-16 which returned 27.4m at 123.0 gram-meters Total Platinum Equivalent (TotPtEq) grade thickness (0.75% Ni, 0.28% Cu, 0.21 g/t Pt and 0.62 g/t Pd, equivalent to 4.48 g/t TotPtEq, or 1.09% Total Nickel Equivalent). Intercepts with grade thickness values over 25 gram-meter TotPtEq are presented above. Intervals with 2E data have composite platinum and palladium assays only. Total Platinum Equivalent (TotPtEq g/t) and Total Nickel Equivalent calculations reflect total gross metal content using metals prices as follows (all USD): $6.00/lb nickel (Ni), $3.00/lb copper (Cu), $20.00/lb cobalt (Co), $1,000/oz platinum (Pt), $1,000/oz palladium (Pd) and $1,250/oz gold (Au). Values have not been adjusted to reflect metallurgical recoveries. Total metal equivalent values include both base and precious metals, where available. Results labelled ‘n/a’ were not assayed for that metal. Total platinum equivalent grade thickness was determined by multiplying the thickness (in meters) by the Total Platinum Equivalent grade (in grams/tonne) to provide gram-meter values (g-m) as shown. CZ04 series drill holes were conducted by Group Ten’s QP and are not considered historic. 355 series drill are considered historic and have not been independently verified by Group Ten. Subsequent drilling in 2004 within the footprint of the historic Camp Zone holes confirms the presence of broad zones of nickel and copper sulphides and also identified significant associated precious metal and cobalt mineralization with hole CZ04-1 returning 83.5 meters at 131.1 g-m TotPtEq including 25.2 meters at 2.82 g/t TotPtEq (or 0.69% TotNiEq). This hole comprised 0.33% Ni, 0.23% Cu, 0.025% Co, and 0.62 g/t 3E (as 0.16 g/t Pt, 0.38 g/t Pd, 0.08 g/t Au). Like the Hybrid Zone target area at Chrome Mountain (announced February 21, 2019), past work in the Camp Zone target area provides the Company with drill-defined wide intervals of mineralization that have typically only been tested to less than 150 meters of depth. These zones remain open in all directions and the adjacent soil and geophysical anomalies remain untested (see Figure 2). The Company is targeting a Platreef-type setting at the Camp Zone where bulk-tonnage sulphide mineralization in the Basal Series of the complex may be associated with interaction between the layered basal magmatic system and the basement country rocks. Interaction and assimilation of basement country rocks is an important component of the Platreef deposits in the Bushveld Complex, where the country rocks may be in place as the footwall or occur as large rafts within the layered magmatic stratigraphy. The potential for this setting at the Camp Zone is supported by deep conductive geophysical targets along with historic drilling just south of the Camp Zone, where hole IM01 drilled through iron formation starting at surface, in what had been interpreted as basement country rocks, before returning to mineralized layered ultramafic rocks below (see Figure 4). The multi-kilometer geophysical, geochemical and geological signatures present compelling bulk-tonnage targets in this type of setting for PGE-enriched Ni-Cu sulphides in the lower Stillwater Complex stratigraphy. The Camp Zone target area is a priority for follow-up work in 2019 based on the potential for large-scale disseminated and massive nickel and copper sulphide mineralization enriched in PGE, gold and cobalt. Group Ten sees the potential to expand known mineralization in terms of both scale and grade and rapidly advance these areas to resource delineation stage through the application of a systematic approach and the predictive geologic model developed to date. 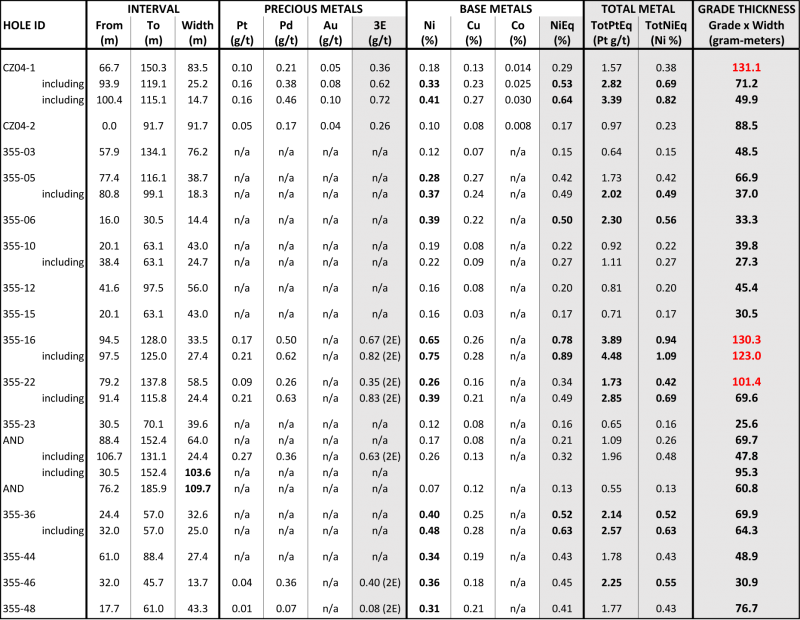 Note 1: Report on Montana Platinum Group Metal Mineral Assets of Sibanye-Stillwater, November 2017, Measured and Indicated Resources of 57.2 million tonnes grading 17.0 g/t Pt+Pd containing 31.3 million ounces and 92.5 million tonnes grading 16.6 g/t containing 49.4 million ounces. Grade thickness was determined by applying the reported minimum mining width of 2.0 meters to the M&I grade of 17 g/t Pt+Pd for an average grade thickness of approximately 34 gram-meter (g-m). 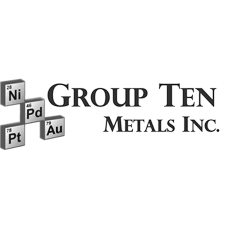 Group Ten Metals Inc. is a TSX-V-listed Canadian mineral exploration company focused on the development of high-quality platinum, palladium, nickel, copper, cobalt and gold exploration assets in top North American mining jurisdictions. The Company’s core asset is the Stillwater West PGE-Ni-Cu project adjacent to Sibanye-Stillwater’s high-grade PGE mines in Montana, USA. Group Ten also holds the high-grade Black Lake-Drayton Gold project in the Rainy River district of northwest Ontario and the highly prospective Kluane PGE-Ni-Cu project on trend with Nickel Creek Platinum’s Wellgreen deposit in Canada‘s Yukon Territory. The Metallic Group is a collaboration of leading precious and base metals exploration companies, with a portfolio of large, brownfields assets in established mining districts adjacent to some of the industry’s highest-grade producers of platinum, palladium, silver and copper. Member companies include Group Ten Metals (TSX-V: PGE) in the Stillwater PGM-Ni-Cu district of Montana, Metallic Minerals (TSX-V: MMG) in the Yukon’s Keno Hill silver district, and Granite Creek Copper (TSX-V: GCX) in the Yukon’s Carmacks copper district. The founders and team members of the Metallic Group include highly successful explorationists formerly with some of the industry’s leading explorer/developers and major producers and are undertaking a systematic approach to exploration using new models and technologies to facilitate discoveries in these proven historic mining districts.